Conservatory and Orangery - discover the difference ? A brief history the Conservatory and Orangery. Few people know that the Orangery came first. Its history dates back to the 17th century in Northern Europe. In England it was mainly stately homes that had the benefit of an orangery. A modern orangery or Glazed Extension with Bi-Folding doors, provides all year round living space to your home. In the past orangeries were used in these stately homes to protect valuable fruits in the winter months. In recent years the orangery has seen a come back. Many Surrey home owners see the advantages an Orangery or a Glazed extension can have over a “bolt on” conservatory. Orangeries offer all the advantages of a conservatory. They have the extra benefit of solid walls and the ability to truly be a room for use all year round. They have large windows that have the option to take many door types such as Bi-folding doors, French doors or Patio Doors. This makes them a unique and valuable addition to any home. An orangery be used as much needed extra living space or as part of a kitchen extension. Perhaps a playroom, study or any other useful space. It is fair to say an orangery may give you much more use over a conservatory. 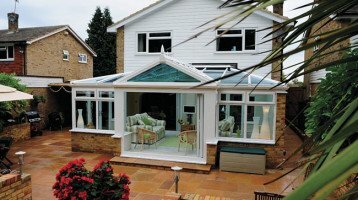 Orangeries provide something unique to a home. And it seems they are set to remain as the preferred choice for extending properties. With the current down turn in property sales and the “move don’t improve” trend, it may be a really wise home improvement choice . Orangeries are usually built with more brick work and full height brick pillars creating a luxury feeling. Conservatories can be seen as more of a garden room with larger amounts of glass. For these reasons Orangeries are normally more expensive to build. Orangeries also feel more part of your existing building. They use properly built and insulated walls and are a real brick extension. 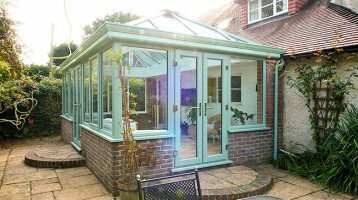 The main difference between orangeries and conservatories is the structure. An orangery once finished will truly form an big part of your home.